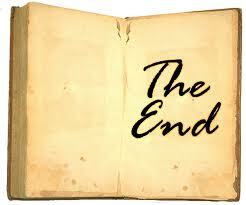 My recently finished manuscript is finally with my agent and publisher. Here is a brief blurb. When Brisbane lawyer, Clare Mitchell, becomes the unlikely carer of Jack, a little autistic boy, her life is turned upside down. In desperation she turns her back on her job, and takes Jack to Bundara, her grandfather’s Clydesdale stud at Merriang, in the foothills of the beautiful Bunya Mountains. She arrives to find part of the property leased by local vet, Tom Lord, an advocate of equine therapy for traumatised children. Jack falls in love with Bundara’s animals, and Clare falls in love with Tom and the life of a country vet. But trouble is coming, trouble that threatens to not only destroy Clare’s new-found happiness, but the tiny town of Merriang itself. My new novel is due out with Penguin in July next year, and I’m pleased to report that it has been well received by Belinda Byrne, my publisher. So while I wait for the inevitable grind of edits to begin, it’s time to plan my next novel. Some people seem to have multiple narratives swirling around in their minds at any given time. Unfortunately, I’m not one of them. It can take a long time for me to plot a new story. There are many ways to come up with fresh ideas. The High-Concept Approach. This is a movie term, that works something like this. Pick a tried and true scenario and tweak it a little, or a lot, and/or combine two together. My friend and publishing buddy, Kathryn Ledson, used this concept to successfully write, and then sell her Erica Jewell series to Penguin (The first book, Rough Diamond, will be out with Penguin in January) It’s a cross between Bridget Jones and Indiana Jones. 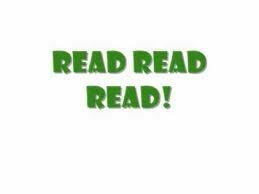 Read Read everything you can, in and out of your chosen genre, fiction and non-fiction. 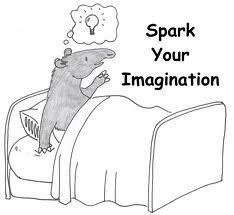 Allow another imagination to cross-fertilise your own. There’s much truth in the old adage, show me a writer that’s not reading, and I’ll show you a writer that’s not writing. Look Around You Keep a keen eye on what topics are in the news. What are your friends talking about? What concerns keep you awake at night? Eavesdropping is also a useful skill for writers. Listen in when other people talk. Mobile phone conversations on trains are good for this. Don’t let them annoy you – let them inspire you. Hang out in bookstores. This is critical. Pay close attention to those New Releases. Get to know what’s new and hot in your area. Find out what’s selling, and to which publishers. Remember that you need an idea that other people (not just you!) can get excited about. As I said last week, I have a vague idea for the new novel. My task for October is to develop a rough plan, with themes and characters that will sustain me over the next twelve months of writing. What’s a fun, practical and slightly extravagant way to spend the advance on signing for my new novel Firewater? 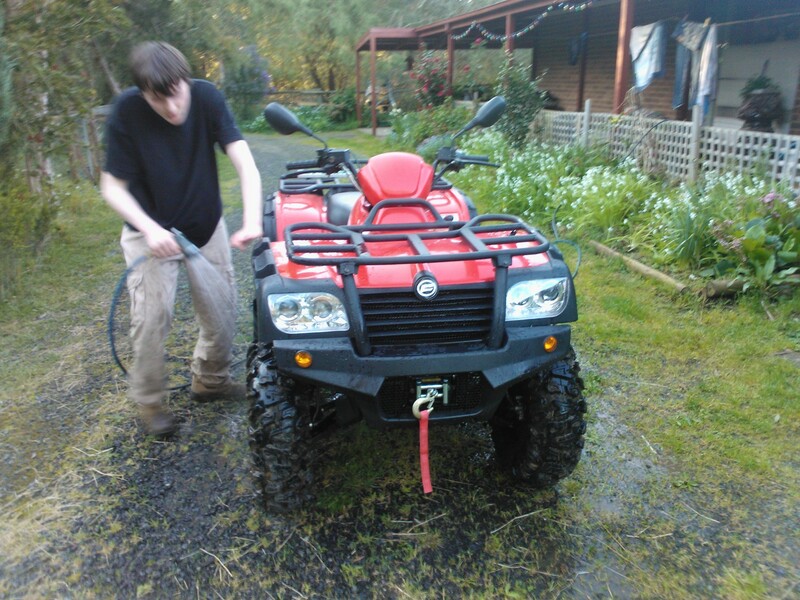 Buy a brand new quad bike, of course. Meet the Wombat, a CFMoto ATV/Quadricycle, being touted as Australia’s best value ATV – a workhorse suited for the farm or simply fun. For anybody who is interested, here is the manufacturer’s blurb. manageable power. To further enhance versatility, the rider also has the ability to electronically select between 2WD & 4WD modes, HI and LOW ranges and lock the differential when extra traction is required. A solid independent rear suspension (IRS) package helps minimise body roll and ensure a smooth and stable ride. The 19 litre fuel tank allows the CF500 to run for hours and the front and rear racks come in handy for cargo. The CF500 is supported by a one year limited factory warranty and nation-wide dealer network. I’m even getting a custom-made trailer, which fits a 150 litre spray unit. Ragwort and blackberries, meet your doom! My youngest son is seventeen years old, and thinks all his Christmases have come at once. 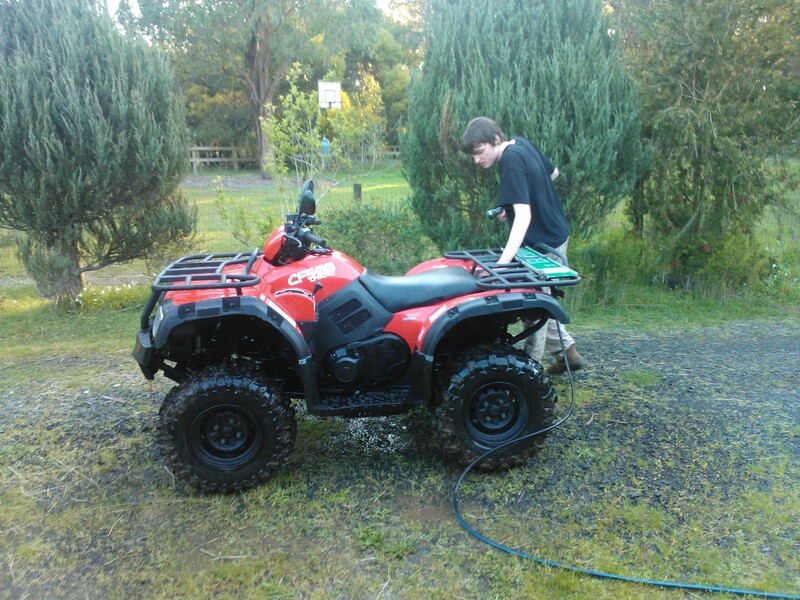 The photos show him washing the Wombat, of his own free will. Will wonders never cease? I’m currently doing revisions of the first draft of Firewater. The deadline for turning the manuscript in to Penguin is October 3rd, and I should be able to manage that. Then a month long break from writing, before I tackle my new novel. It’s just a kernel of an idea at the moment. I suspect my writing free October will be a month of mulling. First Draft – what now? I’m very pleased to announce that I’ve finished the first draft of my new novel. Typing The End on a first draft is a truly marvellous moment. For me, it comes after much hair-tearing, wine, chocolate and the occasional sublime moment of inspiration. It is a time to celebrate and catch your breath. It’s a time to put the manuscript aside for a bit to get some distance. For the real work is about to begin. You have your painstakingly manufactured canvas. Now it’s time to paint. 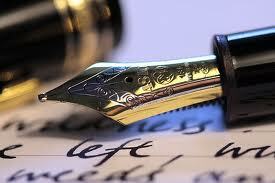 It is often said that there is no great writing, only great rewriting. (Justice Brandeis) The legendary Peter Bishop, former creative director of Varuna, Australia’s national writer’s centre, once put it to me like this. The first draft is the writer’s draft. It’s essentially the writer telling himself the story. You need to revise it within an inch of its life – cutting, adding, polishing and shaping, until you have a reader’s draft. Only then should you contemplate launching it into the world. Let it be said though, adding layers of richness to this first draft is a gazillion times easier than bashing it out in the first place. This is the time to interrogate your narrative. Does it have emotional depth? Do your protagonist and antagonist develop in a believable way? What about sensory description? Can your readers hear, smell, taste and feel what your characters do? 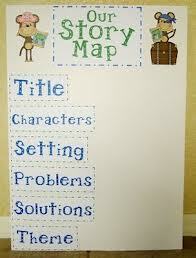 Go through any notes you may have, for details that will enhance the credibility of your narrative. There was a time before I was published that this was an open-ended process. I literally redrafted and redrafted until it was done. Deadlines have put paid to this luxury. I hone the story until the clock runs out, and then look forward to having another run through once editing comes around. Nevertheless, for me this is still the most enjoyable and satisfying part of the writing process. What do others think? I’m on my way home from a research trip to the Bunya Mountains in southern Queensland, that state’s second oldest national park. My new novel, Firewater, is set in and around this marvellous place. The park boasts the largest stand of Bunya pines in the world, primeval trees whose fossils date back to the Mesozoic era. Bunya cones are large as footballs and can weigh ten kilograms. Few animals today are capable of spreading their gigantic seeds, making it hard for the trees to extend their range. Given the cones’ mammoth size, it is likely that extinct large animals were dispersers for the Bunya – perhaps dinosaurs and later, megafauna. The park seems captured in a time warp. 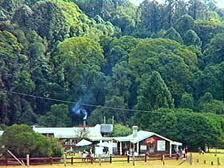 For thousands of years, indigenous people gathered here in summer to feast on Bunya nuts. For the traditional custodians of the park, these ancient pines are an age-old symbol of nourishment, of healing, and of coming together in harmony. I got goosebumps when wandering the rainforest trails. 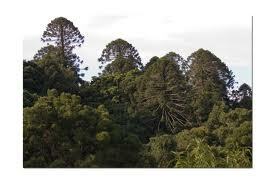 The pines’ domed heads reach forty metres to the sky, and massive, elephant-like buttresses hold fast to the earth. Each tree is a reminder of the mysterious past, and of how few truly wild places still exist. The park abounds with wildlife, waterfalls and mountain-top grasslands known as ‘balds’. I had the great privilege of watching a Satin bowerbird decorate his twig entwined bower. Brush turkeys went about their jobs as rainforest gardeners. Red-necked pademelons (Thylogale thetis) were numerous and absurdly tame. 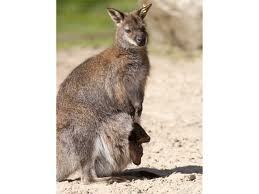 I even spotted a mum with rare twin joeys. The park is a veritable garden of Eden … and Bunya nuts are great to cook with. It has been a sensational trip. Coincidentally, I caught fellow rural author Nicole Alexander at the Dalby RSL on my way through. She was talking about her latest novel, Absolution Creek. I made great progress with my own writing. My new novel Firewater, is almost finished. Two chapters to go! I look forward to typing The End on the manuscript very soon. If I ever lack inspiration, I’ll just think back to my time in the Bunyas and the moment will surely pass. Today is Wattle Day, the first of September. Wattles have long had special meanings for Australians. 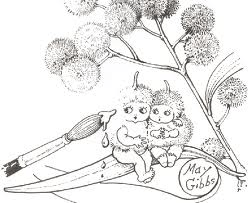 I remember bringing wattle sprigs to school on this day, to celebrate the coming spring. In 1988 the Golden Wattle (Acacia pycnantha) was officially gazetted as Australia’s national floral emblem, and in 1992, the first day of September was officially declared ‘National Wattle Day’, a day first celebrated way back in 1910. Golden Wattle, Australia’s floral emblem, is in full bloom here at Pilyara, lending the bush a sun-kissed appearance on even the darkest day. Although winter still stands in firm command of the southern Victorian ranges, wattle blossom promises warmer days to come. 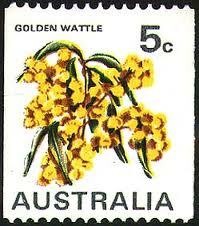 The Golden Wattle grows as a shrub or small tree, and has foliage that is long, arched and bright green. It flowers from July to September, with fragrant golden orbs of blossom. Its gum is eaten by sugar gliders during winter. Its leaves are food for caterpillars of the Common Imperial Blue Butterfly, and its flowers attract native bees. There are more than 900 species of Acacia in Australia, making it our largest floral genus. I know of nine other wattles indigenous to this area, besides the Golden: the Silver Wattle (Acacia dealbata), the Black Wattle (Acacia mearnsii), the Blackwood (Acacia melanoxylon), the Myrtle Wattle (Acacia myrtifolia), the Spike Wattle (Acacia oxycedrus), the Hedge Wattle (Acacia paradoxa), the Hop Wattle (Acacia stricta), the Sweet Wattle (Acacia suaveolens) and Prickly Moses (Acacia verticillata), whose sharp foliage forms star-shaped rings around its stems, with spikes that can rip through clothing. The common names of many of Australian Acacia’s are especially evocative: Brigalow, Coojong, Cootamundra, Dagger Wattle, Dead-finish Wattle, Kurara, Gundabluey, Myall, Mulga, Old Man Wodjil, Stinking Gidgee, Yarran and Wait-a-While. I love these names! And I love knowing that spring is just around the corner. 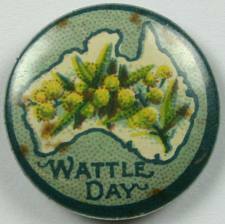 I wish you all a happy Wattle Day for September 1st and will raise a glass of bubbly! 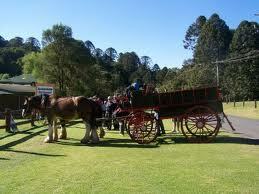 Does anybody else celebrate Wattle Day?